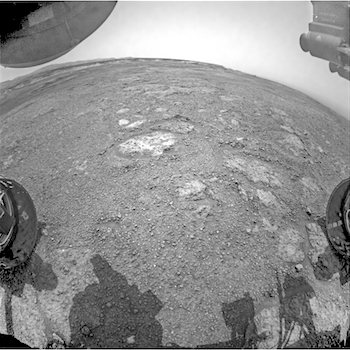 Sols 2288-90, January 11, 2019, update by MSL scientist Suzanne Schwenzer: We will soon be leaving the Rock Hall area, thus this one last look at the drill site from a hazard camera perspective. Seeing those holes always is special, even for #19! This entry was posted in Reports and tagged Aeolis Mons, Curiosity, Dufftown, Gale Crater, Lairg, Mars Science Laboratory, Mount Sharp, MSL, Murray Formation, NASA, Rock Hall, Vera Rubin Ridge. Bookmark the permalink.